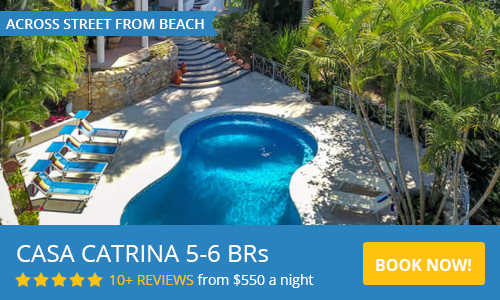 Casita del Mar in Sayulita is a 3 bedroom, 3 bath beachfront home on three levels with private dipping pool on the quiet, sought after north side of Sayulita. Casita del Mar accommodates 6 guests. 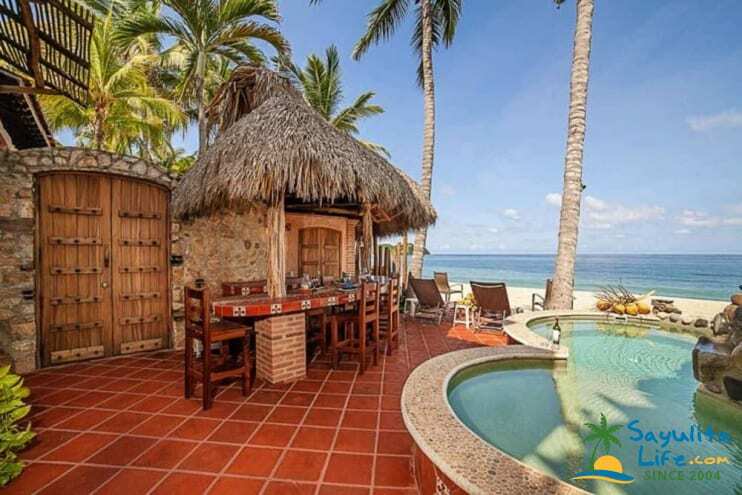 The fully equipped kitchen opens onto a beachfront patio with a palapa covered eating bar with gorgeous ocean view, a dipping pool and private beach access. You are literally steps from the sand and the north end of the beach is rarely crowded. The rooftop terrace is a great place for lounging, sunning, morning coffee or yoga, and evening cocktails and watching the sunset. The views are stunning from here! Need more room for a larger group? We also have Casa Gallo, a 4 bedroom, 3 bath beachfront home next door with large pool that accommodates 10 guests. The homes are completely private from one another and separated by a large privacy wall. View our Casa Gallo rental page here. For even larger groups, it can be opened up and rented as Gallo del Mar, a 7 bedroom, 6 bath estate with 2 pools and 2 kitchens for groups up to 16 people. View our Gallo del Mar rental page here. We recently returned from our final Spring Break with the kids- and had a great time. We've been to Sayulita several times and stayed in many different homes, this one by far was our favorite.we loved the location - far enough away from the crowds and beach vendors, yet close enough to stroll into town. Lucy was great to deal with and the housekeepers were terrific! We had an amazing week at the Casita Del Mar. The pictures are accurate - this place really is gorgeous. You can't beat the location, very private beach with great swimming and boogie boarding potential. We rented a golf cart for our week which was nice, but it really is just a ten minute walk to town. The open shower in the master bedroom is awesome. I've never seen anything like it. We're hoping to go back next year with our expanded family and rent both Casa Gallo and Casita (Cabillito) Del Mar. Highly recommend this place. All I can say is wow.. what a great place! What a great stay at Casita del Mar in Sayulita! The home is located on the beach at the north end of town about a 20 minute walk from the town center. There are two nice master suite bedrooms with balconies (one on the third floor and one on the second floor) plus the kitchen and an additional flex space (which we used as a third bedroom with two twin beds) on the first floor. There is a nice plunge pool and outdoor eating area on the front patio. The home was built recently and is in great condition with tasteful finishes and decorations. It is the sister property but completely private to the larger Casa Gallo next door (it is actually attached and can be rented in conjunction with Casa Gallo), but was a perfect size for our family of 6. The guests next door at Casa Gallo were unfortunately younger and louder than we were and made some noise at night when we were going to bed but that is the only thing I would change. The management and staff were fantastic. We hired Lucy the property manager to prepare a wonderful Mexican dinner for us one night at the house. With two master suites plus the flex space first floor bedroom, it is a home ideal for two couples, or for one larger family. We can't wait to return! For your security we accept credit cards via Paypal, with a 5% Paypal fee. We also accept wire transfers to our US bank account and CAN e transfers with a 5% fee. Casita Caballito del Mar. 3 bedroom / 3 bath and sleeps up to 6 people.